I’ve written before about All Saints Day on November 1st in Poland, posting photos from an evening visit to military cemetaries at the Citadel in Poznan, or an early morning visit on November 2nd while groups were tidying up the cemetary, picking up trash and relighting candles. Today, I want to compare and contrast All Saints Day in Poland to a Dia de los Muertos (Day of the Dead) as it’s celebrated here in Tucson. Day of the Dead has it’s roots in Atzec civilization. When the Spainish arrived brining Catholisism to the New World, they insisted the locals had to adapt their Day of the Dead celebration to fit with the Catholic Tradition of All Souls/All Saints Day, so the timing changed from Spring to Fall. The church where I’m working will celebrate All Souls Day on November 2nd. 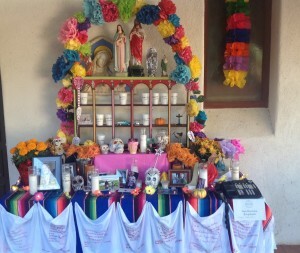 An artist who happens to be my colleague on the church staff, Stella M. Lopez, for several years, been setting up and ofrenda (offering in English) in the columbarium, just outside the church. 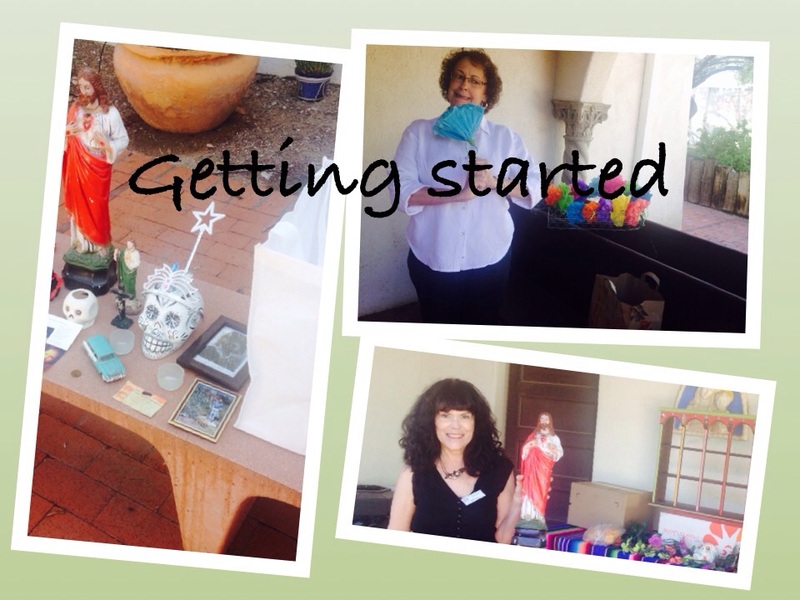 She creates a similar ofrenda at the Tucson Botantical Garden. She’s sharing with us a practice she learned from her Mexican-American grandmother and great-grandmother. These ladies kept small shrines on a bureau or chest of drawers in their bedrooms, faithfully saying their morning and evening prayers in front of the shrines which would have rosaries, flowers, candles, photos of favorite saints, or during World War II photos of sons who were had been called up. Even though Stella’s parents were both from Mexican families and grew up in Tucson, but they didn’t want their children to learn Spanish. They wanted them to speak English without an accent. Something I’ve heard of Polish-American families doing too. Their home, which moved from place to place during her father’s military career, had a more cosmopolitan feel than that of her aunts and uncles back in Tucson. Stella would tell you that she returned to her Mexican roots as a young adult when she was far from home and family, studying art in Boston. That’s when she began keeping a shrine at home, a practice she continues today. Hers is on the wall in her breakfast nook. It not only has items that remind her of saints and departed loved ones, but also photos of her daughter, projects that are of interest, etc. 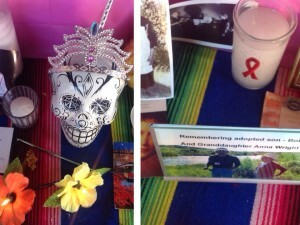 Some items from her personal shrine are brought in for the ofrenda she sets up at church. Members of the congregation are urged to bring in items or photos that remind them of loved ones who have passed on. The collection keeps growing as the days go by. On November 2nd, the church had a service to rember those in the congregation who have died in the last year, and they processed past the ofrenda by candlelight. 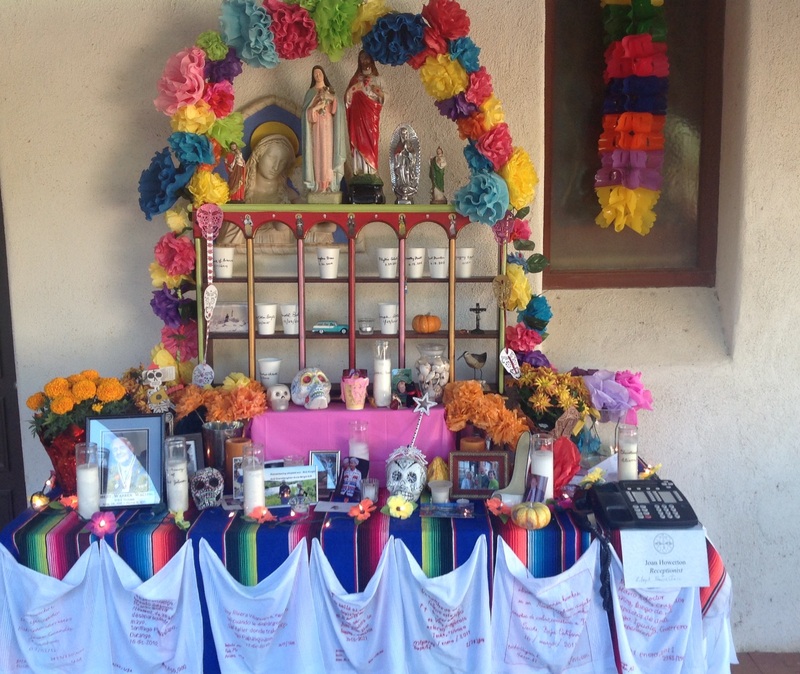 Tucson is home to one of the largest Dia de los Muertos processions. Stella and her daughter have always participated since it began in the 1990s. They’ll join 150,000 other Tucsonans, who will walk two miles togehter and at the end of their march will burn in a cerimonial urn scraps of paper that contain the memories and prayers for the deceased. I told Stella about the significance of All Saints Day in Poland, how families gather to pray for ancestors who might not have made it to heaven yet, for those who might be stuck in pergatory. She said that the emphasis of Dia de los Muertos was different, that the goal was not to pray the departed to heaven, but to encourage them to return and visit us here on earth. That’s why things are put out on ofrendas that would hold meaning for deceased loved ones, to entice them to return for one day, including favorite foods or cigarettes. I wondered how Stella felt about the surging popularity of this celebration. She said she can see why non-hispanics would be drawn to the tradition because of the colorful pagentry. She said those who participate in the Tucson procession behave appropriately and understand the significance of the day. They haven’t made it into warped American version of the holiday, as we have with St. Patrick’s Day and Cinco de Mayo. Check out some of Stella’s Dia de los Muertos artwork on her website. I’m happy to have one of her butterflies. Traveling through Belize, Guatemala and Honduras on my trip, my favorite cemeteries were the Mayan ones. Super colorful and bright and they were all being spruced up and readied for, the upcoming, Dia de los Muertos, getting more decorated and prepared as the days passed. Your recent trip sounds like such an adventure! The All Souls Procession is such a combination of cultures and, when we first moved here, we were told that it is kept very separate from Halloween, so as not to mistake it for a costume party. It is respectful and beautiful and joyous and bittersweet. I love the procession, although I don’t go each year. I am sorry I missed Stella’s offrenda at the church! I guess that’s why they’re doing it on the following weekend.